We used to make a huge production out of the annual-tree claiming event. We’d load up the VW camper, grab a $5 (bargain!) Forest Service tree-cutting permit, drive up toward the snow for a while, and tromp around in the (snowy, wet, muddy,etc) woods, until we found a tree we could all agree on. Of course, said tree was always double the size we needed (they look smaller in the forest), so fresh we couldn’t bear to take it down until Valentine’s day, and that five-dollar permit usually involved an oil change, a swap to the snow tires, and at least a tank of gas. So really, $5 plus another eighty or so & change. 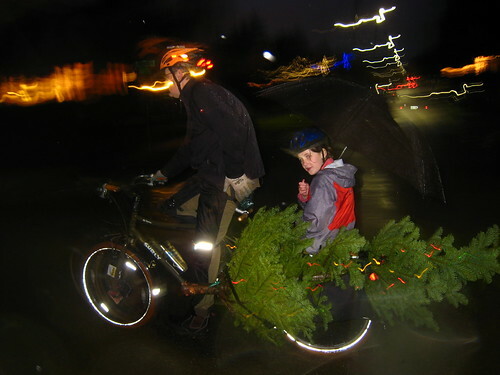 So when we seriously started doing the long-bike thing, we thought we’d give our auto-induced tree haulin’ a break for a year so we could support our local, neighborhood tree lot and find out if was really possible to haul (it seems so obvious now) our family tree via bike. I mean, it’s just a year, right? Then we’ll go back to fun way up in the snow.